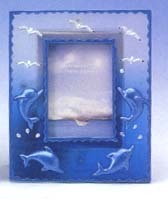 Your pictures will look great in this translucent frosted resin Dolphin and Seagulls Picture Frame! A perfect gift for a friend or loved one. Imagine this magical picture frame adding a special touch to a child's room with memories to last a life time.